Every day can feel like a luxury hotel retreat when your home includes a modern master bathroom with a spa-like ambience and upscale amenities. When building new or considering a major home renovation project, invest in your master bath to maximize comfort, space and aesthetics. – ample, shadow-free light for routine grooming such as shaving and applying makeup. – bouncing light off the ceiling to soften shadows and create a floor to ceiling glow. – provides depth and dimension, allowing you to illuminate select design and detailed bath features. – eye-catching fixtures that bring personality and luxury to your master bath design. 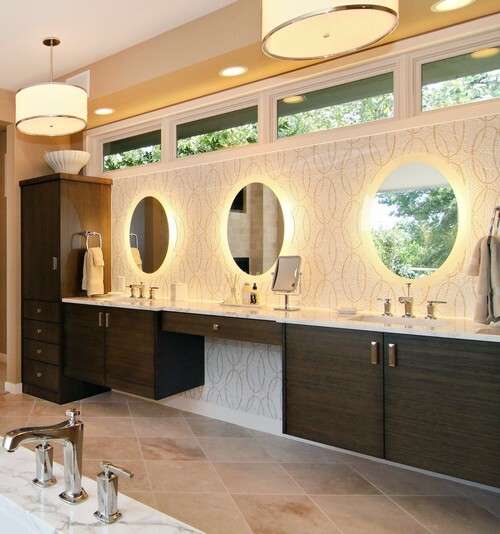 Suspension lights, backlit mirrors and recessed lighting create the perfect healthy bathroom glow. Photo courtesy of Design by Lisa. Achieve maximum storage and eye-catching style using fitted furniture for sink encasements, vanities and cabinets. Color and style are important when selecting furniture for your new master bath. White-finish fitted furniture gives bathrooms a crisp and contemporary feel. Today’s contemporary preferences also embrace unusual wood-grains for bathroom furniture. Dark wood fitted furniture vanities, soaking tub, expansive views of woods beyond, natural and layered light. Commonwealth Home Design new master bath as part of whole house build. There’s nothing like a long, hot shower to loosen up our tired bodies and release our minds from stress. 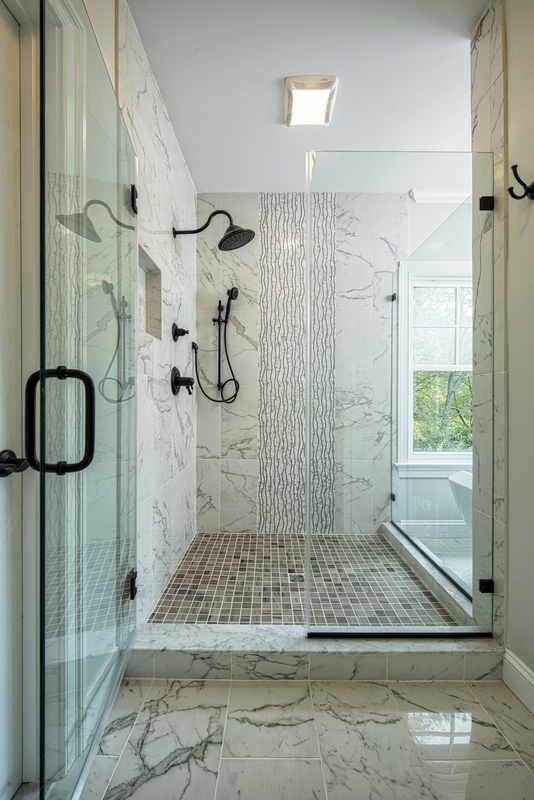 Multiple shower heads, temperature control and bench seating can turn a shower into a room of its own. Combine shower components in a variety of ways to accommodate the perfect spa-like atmosphere. Multi-function shower heads deliver a variety of massage options, from pulsing to mists. Rainhead fixtures mimic the feeling of an outdoor summer shower. Bodysprays and hand-held shower heads allow you to direct the water flow right where you need it, providing relief for everyday aches and pains. Multiple shower heads, artistic tile design, and frameless shower. Commonwealth Home Design new master bath as part of a whole house build. Stone, marble and tile are all trending finishes for contemporary bathrooms. Combining natural stone textures and marble accents, unique patterned tiles and unexpected tile configurations add signature style to your new bathroom design. Your shower door and glass can be custom fit securely against any surface, eliminating the need for unsightly metal shower frames. It’s a simple upgrade that increases value, adds a touch of luxury, showcases intricate tile work and creates openness in your master bath. 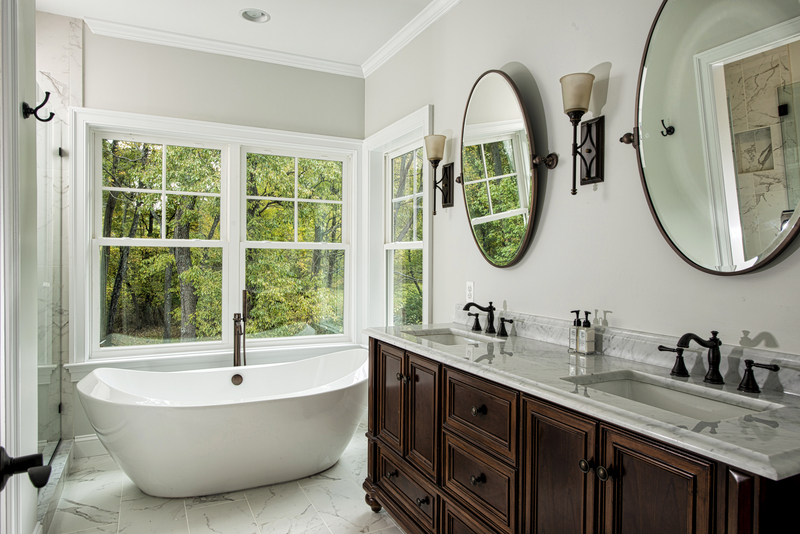 Let the sun shine in by adding bay window, oversized or floor-to-ceiling windows to your master bathroom. You’ll enjoy the warmth and energy of bathing in natural light and the dramatic views of the surrounding landscape — where privacy isn’t a concern. Master bath overlooks a mountain lake with expansive mountain views beyond. Photo courtesy of Carlton Architecture. 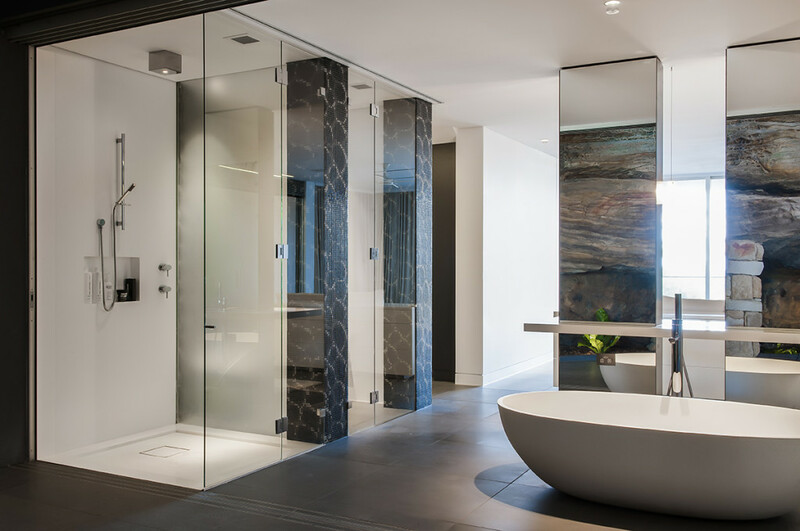 A Zen bathroom embodies simplicity, clean lines, fluidity and functionality. The floor plan should flow effortlessly, blending one space into the next. The art of placement—a focal point such as a claw foot or pedestal tub or fitted furniture—can create a positive channel of energy throughout the space. Natural stone and wood grains, cool grey-brown tones, geometric patterns and glass tile finishes serve as a foundation for a Zen-like bathroom design. Zen master bath design with triple pane frameless shower, clean lines, natural stone finishes, large freestanding soaker tub. Image courtesy of Minosa Design.